Thanks so very much, Lynn, for your kind comments and for making this image one of your favorites. Thank you, Tina LeCour for your kind, supportive comments, and for making this image one of your favorites. 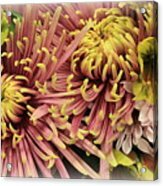 Thanks very much, Beth, for the feature in your great Group, The Most Beautiful Flowers. Thank you so much, Mother Nature. F/L This is a magnificent image of these lovely flowers, Dora - just breath-taking! Thank you, Onedayoneimage Photography, for making this image one of your favorites. Thank you so very much, Cindy Treger! Thank you so very much, Marcia Jones. Thanks so much, Rebecca, for the feature in your great Group, Pin Me. 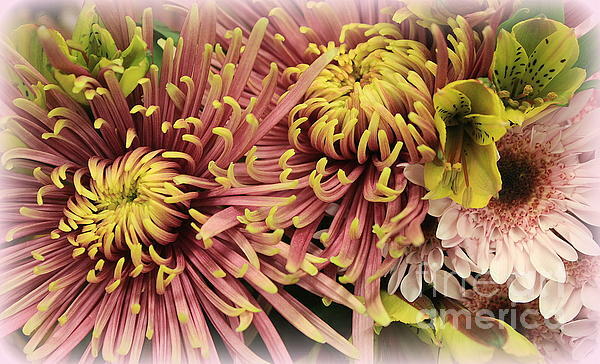 Thank you so much Judy, for the feature in your wonderful Group, USA Photographers ONLY. Thank you so much, Yarinka! Thanks ever so much,Jenn for the feature in your wonderful Group, Bath and Spa Prints. 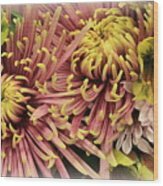 Thank you Hazel Holland, for your kind comment and for support and for making A Touch of Yellow on Pink Mums one of your favorites. Thanks so much, Debra Lynch. 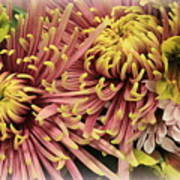 A Touch of Yellow on Pink Mums - Dora Sofia Caputo Chrysanthemums, sometimes called mums or chrysanths, are flowering plants of the genus Chrysanthemum in the family Asteraceae. They are native to Asia and northeastern Europe. Most species originate from East Asia and the center of diversity is in China. 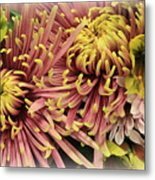 There are about 40 valid species.There are countless horticultural varieties and cultivars.